Commercial roofs aren’t always the prettiest, and you won’t find as many of them on the front of magazines, but you’ll hear about the innovations people make under their shelter. Without commercial roofs, we wouldn’t be where we are now. At Tim Leeper Roofing, we are passionate about keeping the roofs of Nashville healthy and strong whether they be residential or commercial. However, as we said in our last blog, we have a special appreciation for commercial roofs and their service to our community. Commercial roofs require a certain level of expertise, and we can provide it. 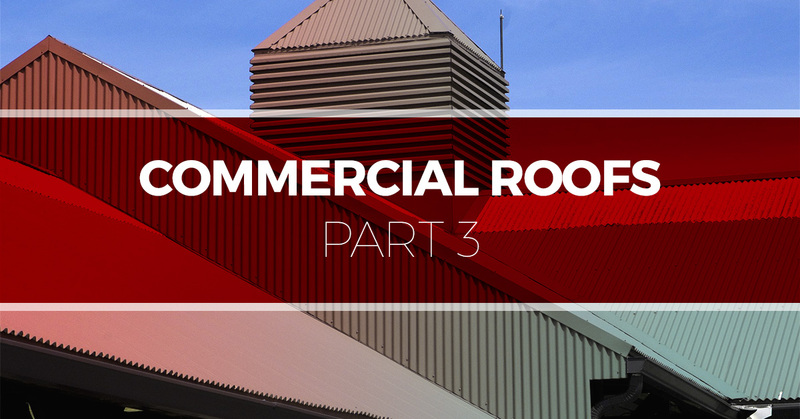 We’ve used the past few blogs to review some of the questions we get about commercial roofs. In today’s blog, we have a couple more insights to share with you! There are little ponds of water on my roof. Is this bad? Can it be fixed? Your roof has a very short list of duties, and shedding water is up at the top of the list. Water’s destructive properties aren’t to be underestimated, and if it starts to gather on your roof, you should be uncomfortable. It is usually a sign of bad workmanship or age and needs to be fixed. The good news is, it’s a common enough problem that we have easy, quick solutions that will return your peace of mind to you. We can use insulation and roof drains to give the water a path to the ground. It’s important to note that a little water collection on your roof is completely natural. It’s pretty much impossible to eliminate every drop. That being said, trust your instincts and contact us if the volume and persistence of moisture on your roof makes you worried. We can do an inspection and let you know if adjustments are necessary. I’m headed for roof replacement. Are there types of materials I should or should not request? Most commercial roofs are flat, and there materials that do and do not work. Flat roofs don’t have the water-shedding advantage of slanted roofs, but they can shed the water just as effectively using systems of slopes and drains. Because water spends more time on flat roofs than it does on slanted ones, materials that are even a little permeable aren’t appropriate for flat roofs. That means that asphalt shingles are out of the question. However, that’s not the only consideration. When we meet with you to discuss your new roof, we will factor in many different things, including the foot traffic your roof gets, the weight of A/C units etc., building access, and cost. We will use all of that information to choose a material that will easily stand up to the elements for decades to come. Your roofing contractor isn’t just a service-provider; they are an ally for your entire operation. Making sure you have an ally who will keep you covered (literally) is absolutely crucial. Turn to Tim Leeper Roofing, the roofing company built on putting the customer’s interests first. We are here to help you, not ourselves. Learn more today!